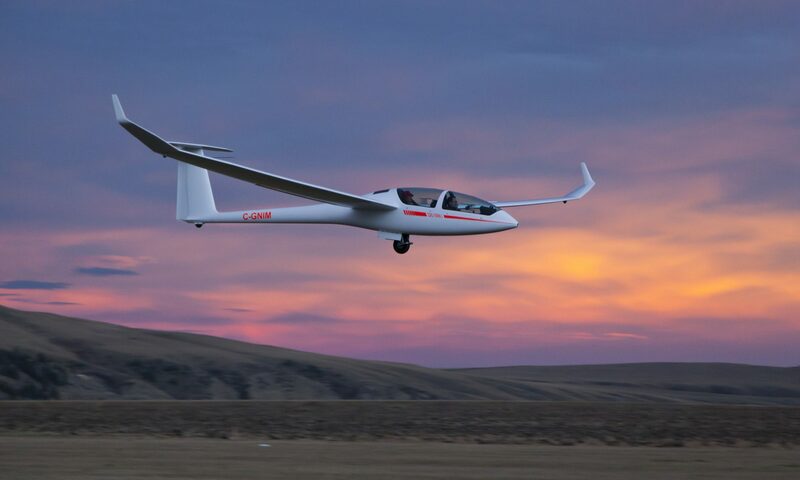 Cu Nim is a modern Canadian gliding club located just outside of Black Diamond, AB. If you are a pilot or wish to be, please come visit. Our club is comprised of high caliber aircraft including a DG-1000, ASW 28 and Cessna 182, and many remarkable individuals. We own and operate the 4 grass runways, known as Black Diamond Airport (CEH2). Pilots enjoy terrific thermal opportunities, with tasks along the Rockies to the US border as well as east into the prairies. Spring thermals, fall wave conditions, and a supportive instructional culture makes Cu Nim an active medium-sized club looking for new, enthusiastic members. Our members range from their teens to their 90’s and represent a variety of cultural and professional backgrounds. Warning: Sustained flight in powerless airplanes is very addictive! Our members cover great distances from our airfield while soaring – sometimes over 600km! As a group, we travel to southern Alberta twice a year for the Cowley Fall and Summer Camps where glider pilots from across North America gather for unique soaring conditions influenced by the Rockies, the Livingstone Range, and other topographical features. More and more members compete in gliding competitions, and some travel internationally to compete. The core flying season for Cu Nim is from March/April through October/November. Members can coordinate flights throughout the winter when Chinooks clear the runway. The club operates Thursday through Sunday through the heart of the flying season – offering introductory and instructional flights. Flight operations for licensed pilots occur any day that a crew can be assembled and when conditions are favorable. We produce a regular club newsletter called ‘Turnpoints‘ which is a great read for prospective members. Cu Nim is a member of the Alberta Soaring Council and the Soaring Association of Canada. When you start your flight training, your flights will stay within gliding distance of the airfield as you develop fundamental flying skills (how the airplane works, turns, speed control, etc). Flights are short to provide exposure to takeoff, aerotow, circuits, and landings. Generally, people need to be conditioned to get comfortable with the forces of maneuvering at higher speeds. Students should plan on several instructional flights per day while training. As awareness, skill and comfort increase, students get early lessons of thermalling and sustained flight. Learning how to thermal is thrilling and frustrating, and ultimately very rewarding. Additional altitude allows lessons to venture further from the local area, for longer flights for more repetition and refinement of flying skills. RGS grads, PPL, ATPL, whatever… if you want to be flying more, fly gliders! Here in Alberta we are lucky to experience a particularly favourable condition for soaring called mountain wave (https://en.wikipedia.org/wiki/Lee_wave). Many members take advantage of wave conditions to travel long distances and to high altitudes. All club gliders are equipped with oxygen systems to enable flights above 12500′. Cowley fall camps often have flights exceeding 20000′ with a few flights exceeding 30000′ (most recently October 2017), all driven by mountain wave. Another way of staying aloft is to use ridge lift, the vertical redirection of wind when it impacts a rise in the land. Finally and most commonly is the use of thermals to gain altitude. These can occur anywhere and enable travel across the open prairies. Learning to find and use thermals is part of the joy and the challenge of becoming a good soaring pilot. All photos on this site are from Cu Nim member flights. See our Facebook and Instagram pages for additional club photos and videos. Have a look at a highlight video from our 2017 season. A thrilling video compilation from the 2017 Summer Cowley Camp. The video features some close proximity flying with our DG-1000. Examples of ridge, wave, and thermal flight are showcased. Smoke from the 2017 wildfires is visible in much of the footage. What happens when you run out of lift? See this video for an in-cockpit view of what happens when flying far from the airfield and running out of lift. This is a normal part of cross-country soaring. Curious how a long distance or high altitude flight is done? Follow the links below to see flight animations showing how pilots make use of thermal, ridge lift, and wave to travel high and far (both flights out of Cowley Alberta, east of the Crownest pass). Cu Nim member Patrick’s first 4 passes of the Livingstone Range, some of this flying is featured in the video above. A thrilling flight from a Canadian F-18 pilot and avid glider pilot exploring the Canadian Rockies and landing in a field near the Crowsnest Pass. Cu Nim Pilots compete through the OLC, here is our 2018 club performance.